YAY! I love an inexpensive meal! 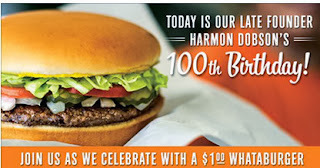 Today only from 5-8pm you can score a Whataburger for $1 at Whataburger! All you have to do is click "Get Offer" on their Facebook page and either print out the coupon or show it on your mobile device.